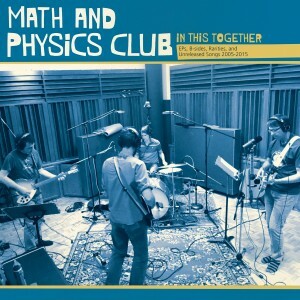 Longtime fans of Pacific Northwest indie darlings Math and Physics Club know the band has never stashed away their lesser material on EPs and b-sides. Some would argue that many of their best songs over the past decade have appeared on exclusive EPs and vinyl-only singles, which is why this collection of non-album tracks plays like one of the band’s finest full length albums. The songs here are presented in reverse chronological order, starting with the stunning new track ‘Coastal California 1985’ that finds the band in fine form with its chiming guitars and swelling harmonies. The album continues without missing a beat, winding through several unreleased and hard-to-find tracks from recent years, including a soft and sweet acoustic arrangement of ‘Do You Keep a Diary’ that turns the tables on the electropop version that originally appeared on the 2007 ‘Baby I’m Yours’ EP. The album concludes with tracks from their beloved and out-of-print first two EPs, with the classic jangle of ‘Movie Ending Romance’ kicking off a relentlessly cracking set of pop that, when presented together this way, serves to highlight the band’s remarkable first year. Math and Physics Club currently hails from Seattle and Olympia and other parts of the Pacific Northwest. They appeared to burst onto the scene in 2005 with their debut EP ‘Weekends Away’ that garnered international attention, but in reality the band had been taking shape in the hearts and basements of childhood friends Charles Bert (vocals) and James Werle (guitar) since the mid-1990s. Never in a hurry, it took nearly a decade before they found Ethan Jones (bass), Kevin Emerson (drums), and Saundrah Humphrey (violin) to complete the lineup, but it was worth the wait. An essential release for Math and Physics Club completists and the perfect starting point for new fans, ‘In This Together’ comes in a handsome eco-wallet featuring photos from the band’s 10-year history and liner notes by Sean Tollefson from Tullycraft.